50five, one of Olisto’s partners and a big player in smarthome retail, wanted to discuss some relevant use cases within the security domain. Safety and security are both important and popular topics in IoT. 50five is not only specialized in smart products but also in smart services. So the wish was to create a campaign with a safety / security product + an extra service added to enhance the safety. Olisto has had the idea for a while to create a trigg for smoke detectors that automatically re-orders batteries. 50five wanted to build this use case with the Nest Protect smoke detector. We needed to bring a few parties together to connect everything together. We were already in conversation with KPN about SMS use cases and with Tikkie about possibilities around payments. A perfect timing for connecting everything with every thing. We connected KPN and Tikkie to the Olisto platform. With the trigg software we then created two bundles for this campaign. Both Tikkie and KPN were invisible for the users. The bundle was pre-filled and only needed to be activated, making it as easy as possible for the user to install. The smart smoke detector from Nest Protect will re-order the batteries when they are empty. 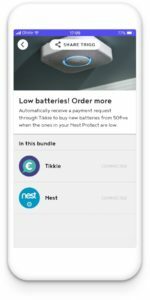 You will receive a Tikkie pay request once your batteries are empty. The only thing you have to do is to accept and pay the Tikkie you receive via SMS and the batteries will be automatically ordered and send. 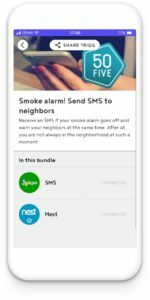 when your Nest smoke detector detects smoke or carbon monoxide, five of your relatives, friends or neighbors will receive an SMS and e-mail. This will come in handy if you are not able to alert someone yourself. This campaign was a perfect fit for the Fire prevention week, who’s main theme was the smoke detector running out of batteries and the danger of that. Without any development effort from the other parties side we were able to quickly realize this new innovate use case.